Halloween in Barcelona is only a couple of weeks away and it is beginning to feel like autumn in the city. The biggest fall celebration in Catalonia is La Castanyada and it begins on October 31st to prepare for All Saints Day on November 1st, also known as Todos Los Santos. Halloween in Barcelona is a new tradition which has caught on in recent years! There are different types of sweet, delectable treats typical during this special time. 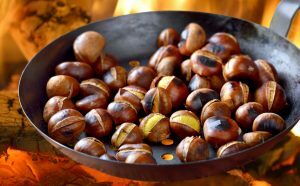 The most popular are “castanyes,” which are roasted chestnuts, often wrapped and served in newspaper. Vendors throughout the streets of Barcelona will be selling them throughout the later part of October in time for La Castanyada. 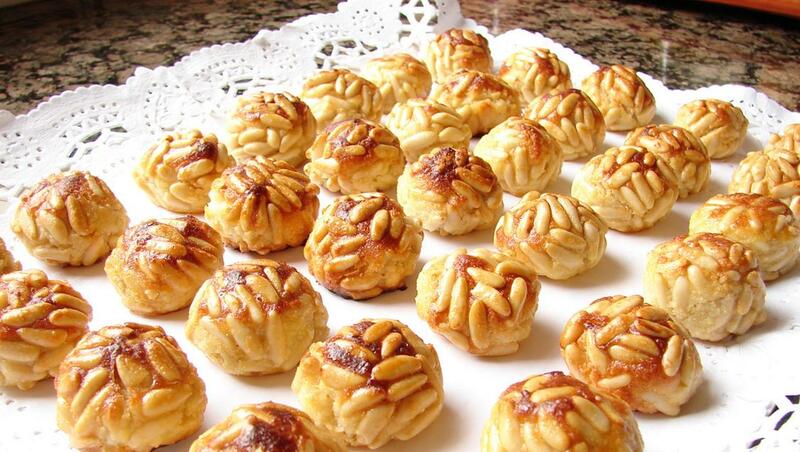 Another famous dessert made around this time is panellets. They are small cookies or cakes made with an almond paste covered in pine nuts. Many bakeries in Barcelona have their own twist on it with other flavours available such as chocolate, lemon, and coconut. These bite-sized pieces of Catalan culture are delicious! Boniatos, the third most popular snack, are roasted or baked sweet potatoes. They are served warm and perfect to pair with the panellets, and washed down with muscatell. Muscatell is a sweet wine made from the muscat grape and complements each treat perfectly. Altogether, these foods are a perfect example of traditional Catalan autumn treats. “Todos Los Santos” is a national holiday, so shops and businesses will be closed this day. This is a time when families celebrate their passed loved ones by visiting the cemetery. 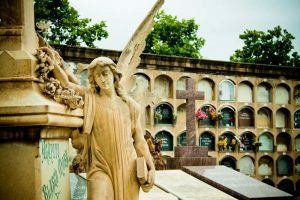 Cemeteries have extended hours and buses are available to go to Montjuic Cemetery and Poble Nou Cemetery. Families visit graves and place flowers, light candles, and hang hand-crafted wreaths to honour their deceased family and friends. Both of these cemeteries are filled with elaborate statues and much history. In addition to the traditional festivities of La Castanyada and Todos Los Santos, Barcelona will have Halloween events available for those who don’t want to put their zombie costume aside. Thriller Nights: Numerous Barcelona nightclubs will have Halloween-themed parties on October 31st, including the popular ones such as Razzmatazz and Catwalk. It is highly encouraged to dress up in your best costume. So, make sure to wear your dancing shoes and bring your Michael Jackson zombie moves! Click here to find your party! Terror Art Escape Experience: For a more interactive horror evening, check out the Terror Art Escape Experience hosted by the NauArt organization. It is an hour-long activity, where artists are unexpectedly contaminated by a virus and you must work as a team to find the healing potion to survive! It costs 10 euros and and you can go as early as 6:00pm to start your Halloween night. 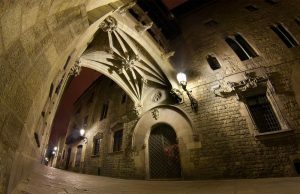 Ghost Tours: If you want to walk around the dark corners of Barcelona while hearing spooky stories about the city’s ghosts, schedule a tour on all Hallow’s eve. Halloween Horror Nights: Barcelona’s famous theme park, PortAventura, has Halloween themed events throughout all of October and gets scarier as it nears October 31st. Go on their website for more information. Fright Night Marathon: If you’re in the mood for a night in or a horror movie fan, a three-movie marathon is available on October 31st to keep the Halloween spirit going! Read here for more details. To be in Barcelona at this time is unique, when you have the chance to experience a Catalan tradition and still have the option to have a fun and spooky time with Halloween.